Finding the best camping c﻿﻿ook﻿﻿ware involves answering quite a few questions. How long is your trip going to be? How long will your equipment last before it becomes obsolete? How often will you be using it? How many people do you need it for? 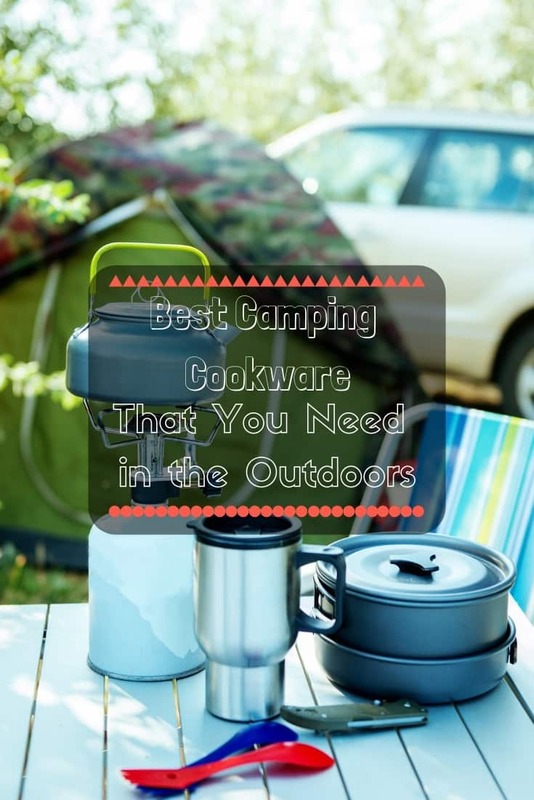 Here, we provide you with some information to choose the best cookware for your camping needs. The first things to consider are materials and designs. What would be comfortable to carry around? Like backpacks and tents, cookware varies in terms of designs and materials. You would want to determine how much time, money, and effort can you spare for the cookware set’s maintenance. For the design, let’s look at the size of the cookware set first. Is it for you alone? Will you be camping with friends or family? How many pieces of cookware do you need? These are practical questions to start with and the answers will help not just in choosing the gears, but also in determining your budget. The answer varies depending on the type of trip you will be going on. What is the size of the meal? Will you be cooking individually or as a group? At the very least, you will need a pot with a lid, a pot holder or a handle, a cup, a plate, and utensils. These items are enough to prepare basic meals. However, for larger meals, additional cookware may be necessary. This is why multi-purpose cookware could be advantageous. A good pot, for example, can be used both for boiling water and for cooking certain types of meals. Each material has its pros and cons. The determining factors are your needs and requirements. Plastic, for example, is the cheapest among the materials. It is lightweight and non-abrasive. However, you cannot use plastic for cooking or anything that requires heat. In fact, poor quality plastic can be harmful when exposed to high levels of heat. Aside from this, plastic also tend to retain food scents, which makes it difficult to clean, especially when you are outdoors. Cast iron, on the other hand, is easy to maintain and durable. However, it is quite heavy and can prove to be a challenge to carry around, especially if you have to go on steep hikes. It also has the tendency to crack or even break if you drop it on a hard surface. Aluminum is another common material. Like cast iron, it is durable. However, aluminium is so much lighter than cast iron. It is also quite affordable. The disadvantage is that it has the tendency to break down when exposed to foods high in acid. It is also likely to have dents and scratches easily. Durable and affordable, stainless steel is another possible option. However, it is not very friendly for long walks or trails since it is heavier than aluminium. At the same time, it is also not a very good material for cooking because it does not distribute heat quite well. Finally, there’s titanium. This material is also very durable, but unlike cast iron and stainless steel, titanium is extremely light. On the downside, titanium products often come with expensive price tags. Also, it’s not best for cooking since, like stainless steel, titanium does not distribute heat very well. 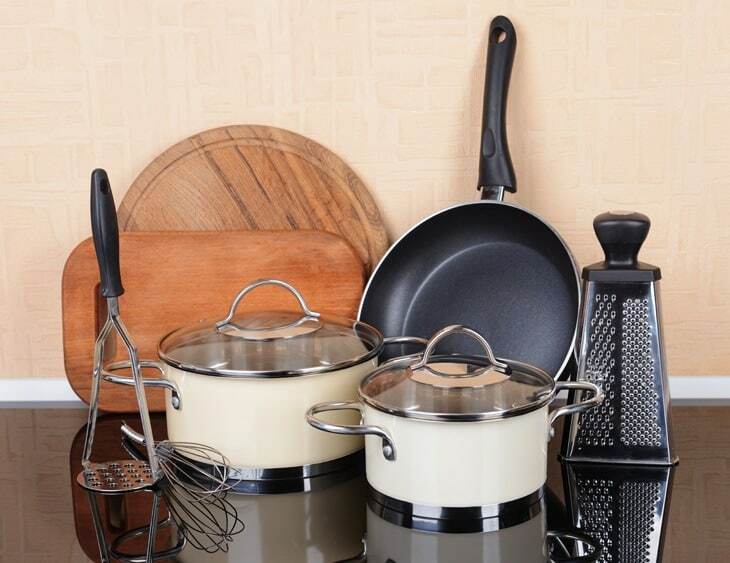 These are your options when it comes to cookware materials. As you can see, there are advantages and disadvantages for each. The best thing you can do is considering your needs and determine which material can cater to those needs. You also need to consider the quantity of pots and pans, the size of pots and pans, lids, accessories, and pot and pan lifters. These factors are very important, especially for longer camping trips. Lids, for example, maximize heat, allowing you to save firewood for cooking. You may also use the lid for other purposes. For example, some brands design lids to be able to fry food. You can also use them as substitute for plates. You also need to consider the size of the pots since you only have limited space in your backpack. Along with this, determine the cooking style so you can decide on the quantity of pots and pans. Since there are no hard and fast rules in determining the number of pieces you need, it is best to plan and determine all of these factors ahead of time. This way you can decide on the best cookware to buy and bring with you. 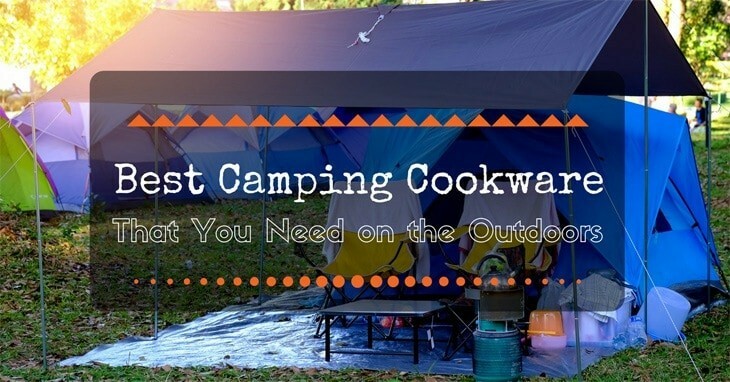 Best #camping cookware that you need in the outdoors! Before you go camping check out this list. 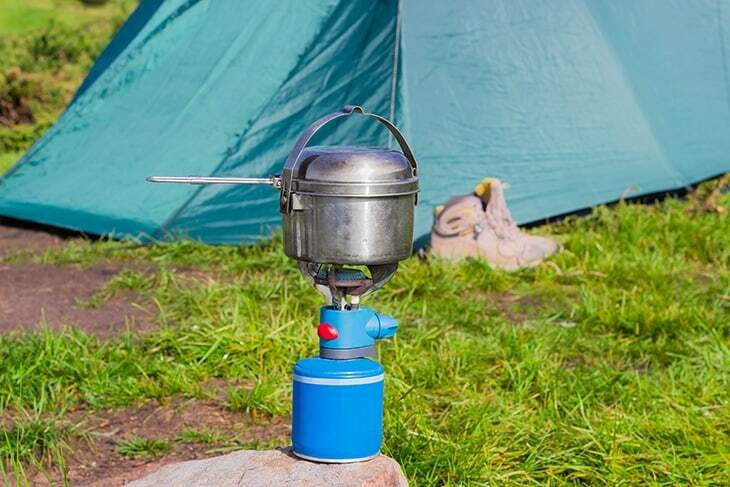 Taking into consideration the factors mentioned above, here are the five camping cookware sets that you should check out. Designed for one or two people, this cookware from OuterEQ is solid and light since the frying pan and pot are made of anodised aluminium. The set is also non-stick so it is very efficient in terms of cooking and cleaning outdoors. 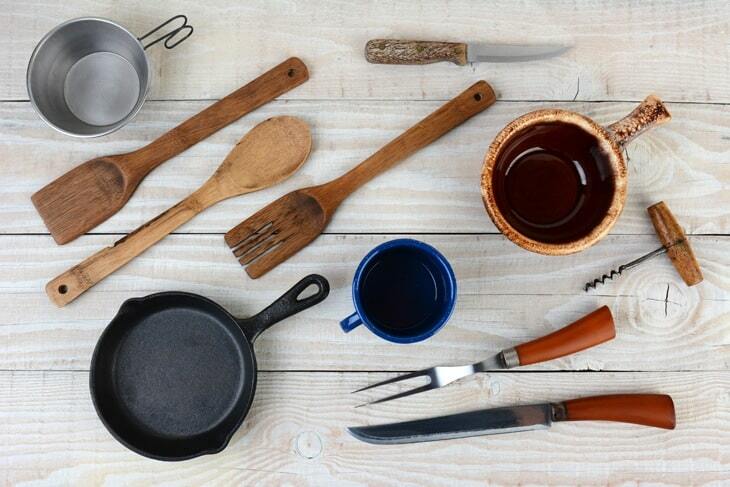 Soup spoon, pot, and frying pan handles are foldable to save space and be highly portable. The entire set is conveniently stored in a mesh bag, easy to pack and carry. Included in the set are a pot, pot cover, frying pan, 2 bowls, rice ladle, soup spoon, and a cleaning loofa scrub. G4Free offers this easy storage and cleaning camping cookware set. The folding handles save space and allow compactness for easy packing and portability. The lid and the pot are fitted together for easy storage when traveling. There is enough space to accommodate additional items such as stove, sponge, pepper, salt, and different seasonings. The cooking set is made of anodized aluminium, FDA-approved to be non-toxic. It also comes with a compact mesh bag for storage when not in use or when carrying in a backpack. The 4 piece set is composed of 1 big pot, 1 big pan, 1 small pot, and 1 small pan. This HealthPro product is another favourite on the market today. It is a 3-piece set made of titanium – 13.5 oz. frying pan, 27 oz. pot, and 40.5 oz. pot. The lid-pan is shaped to be able to receive heat from the pot and act as a cooking pan. 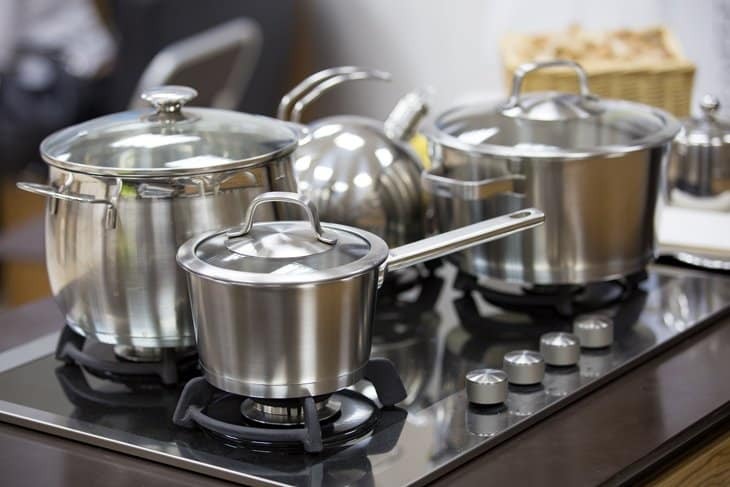 By pairing it with the titanium pots to create a double boiler system, you can cook two items at once, saving both time and fuel. This product weighs 9.2 ounces, making it one of the lightest 3-piece sets in the market today. This MalloMe product is a 10-piece cooking set made of FDA approved anodized aluminium. This material conducts heat evenly and quickly. Built to last, this cookware set is perfect for the outdoors. It is easy to clean and store so it won’t add a huge bulk or weight on your pack. The 10-piece set is composed of 1 liter anodized non-stick pot, pot cover, 2 BPA-free bowls, non-stick pan, BPA-free soup spoon, stainless steel folding spork, wooden spoon spatula, drawstring pouch, cleaning sponge, and smores making and marshmallow roasting guide together with an ebook of 10 camping recipes. The internal surface of this Bis Gear product is made of wear-resistant and non-toxic aluminium oxide. This material allows heat to conduct easily, thus boiling a full pot of water only takes less than 4 minutes. The great thing about this product is, even though the internal surface is heat conductive, the folding handle can resist high temperatures. It is also very easy to fold and keep, saving you weight and storage space. The pot set is made for different purposes. They can be used at home or outdoors. They are great for stir-frying, boiling, or frying. The set is composed of foldable knife, spoon, fork, and spork. The set comes with mini stove, non-stick anodized aluminium pot, BPA-free spoon, 2 BPA-free bowls, non-stick frying pan, pan lid, carabiner, rice ladle, nylon bag, and loofah sponge. Of the five items reviewed in the list, MalloMe ﻿﻿10 Piece Outdoor Cookset stood out primarily due to its efficient design and durability. This item is built to last and is made with the highest quality anodized aluminium, which is FDA approved to be non-toxic. Since it is made for a single camper, it won’t be the best option when it comes to cooking for a large camp. However, this 10-piece set does provide everything you need to cook a good meal outdoors. Considering that it houses an entire set of cookware, it is very compact. In fact, you can even stuff additional items inside the set as it has some more room for other things you may need. This set is also very easy to clean. Wash them, wipe them, and pack them – simple, convenient, and no hassle. More importantly, you don’t have to go through the stress of putting them all together since the design made the task easy. All things considered, this set is maximized for outdoor fun.